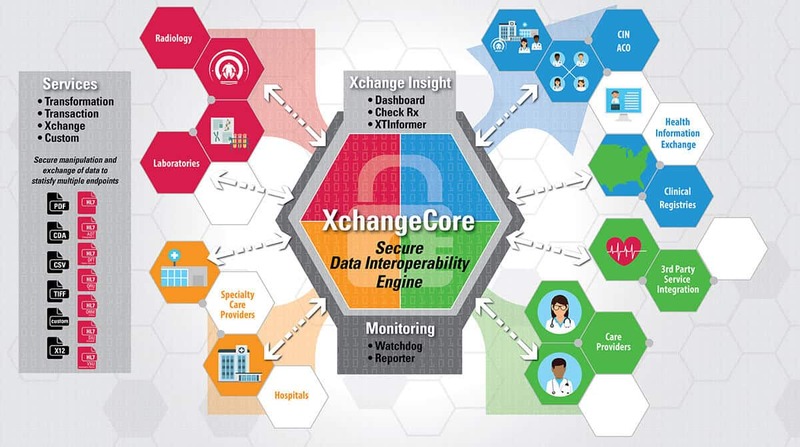 Xchange Technologies, Inc. | Innovative Secured IaaS Solutions for Healthcare Data Transformation, Exchange and Monitoring. Scalable and Sustainable Interoperability Solutions. Our Integration-as-a-Service solution enables you to exchange health data with a wide range of other healthcare providers. That means your patient demographic data, charge capture for billing, immunization records, lab orders/results, scheduling data, continuity of care, and other documents can be reliably transported from Point A to Points B, C, D, and E and back again. Our technology also helps you stay on top of where a message is in the process, at any given time, through a graphical dashboard application. It is all about ensuring data sharing through simplified data interfacing. The Exchange Suite topples those fragmentation barriers that make it hard for other medical providers to access the patient information they need, at the time they need it. You can feel confident in knowing that many leading lab companies, EMR systems, state registries, and clinical repositories throughout the country use our solutions. By using an “Integration-as-a-Service” delivery model, we have succeeded at facilitating real-time exchange of data at a highly affordable price point. Ensuring data sharing through simplified data interfacing. Collecting patient data is crucial, but moving data and transforming data for maximum usability is the real key to the success of a health system, its hospitals, physician practices and clinics. Users need data transparency and monitoring to ensure the best patient outcomes. That’s where XTi comes in. Medical practices that band together to collaborate and negotiate through healthcare organizations may struggle because members have different EMR vendors, creating roadblocks to data exchange among diverse systems. Frustration mounts when you can’t see or monitor where shared information is in its journey to government entities. Technology integration and interfacing issues can create ongoing business problems for labs and the practices that depend on them. Issues with data transfer and data transformation are major contributors to pervasive relationship turn and churn among labs and their customers. Companies that make software for EMR and PMS are constantly challenged to overcome the connectivity issues that stand in the way of potential customers readily adopting their solutions. Now more than ever, software providers want to keep their promises. EHR vendors are constantly challenged to improve data transformation and transmission to a wide variety of national registries greatly advancing the evidence base in health care’s effectiveness, safety, and quality. Secured solutions for integrating multi-protocol data services into your healthcare information system. XTi has your solution for integrating multi-protocol data services into your healthcare information system. The XTi XchangeCore engine provides a comprehensive messaging platform that is stable, secure, and scalable with the ability to perform data mapping and conversion, validating message format and content as well as splitting data feeds to multiple systems. XchangeCore allows seamless interaction with all external data sources, whether they use HL7, X12, EDI, or XML or something else. Innovative Secured IaaS Solutions for Healthcare Data Transformation, Exchange and Monitoring. Copyright 2019 Xchange Technologies, Inc.